I had a couple of quails leftover from something (I forget when), They’d been in the freezer for a while so needed to get rid of them. This great recipe immediately jumped out. Being a child of the 70s I love croquettes. I’d made these before but used chicken – to be honest the taste difference of using quail is not even noticeable – so feel free to substitute. They’re creamy and crunchy all in one. An absolute delight. With a small sharp knife, strip off the meat from the quail and finely chop then set aside. Heat the oil and butter together in a medium saucepan until bubbling. Add the flour and stir well for 2 minutes. Gradually stir in the milk and stock stirring constantly until a thick dough like consistency is formed (about 2 minutes). Beat into the dough the ham and quail meat and season with salt and pepper. Cook over a low heat for 5 minutes. Remove from the heat and spread the dough onto a dinner plate to cool for 30 minutes. Set up 2 small bowls, one with the eggs, the next with the bread crumbs. Roll a small amount of dough into a walnut sized ball then dip it into the egg, then roll it into the breadcrumbs. Arrange on a plate as you repeat with all the dough. Leave the croquetas for 20 minutes to dry slightly. Heat 4 cm of vegetable oil in a medium saucepan until hot. Drop 7-8 croquetas into the oil and fry for 3-4 minutes until golden brown. Drain on paper towels. 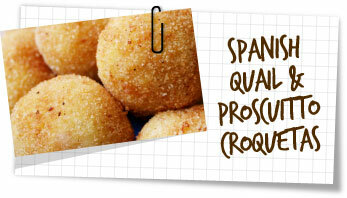 Repeat with the remaining croquetas. Serve hot. Serve with a simple green salad and a side of creamy alioli to dip them into.